1 9-inch baked pastry shell - for homemade crust see recipe below! 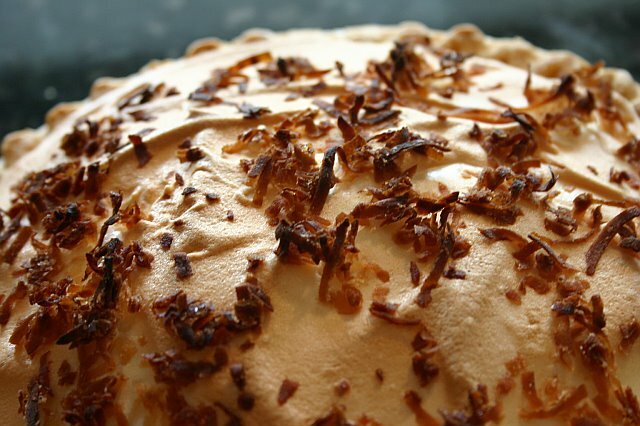 Let egg whites stand at room temperature for 30 minutes (this makes fluffier meringue). Meanwhile, for filling, in a medium saucepan combine the first 1/3 cup sugar, cornstarch, and salt. Stir in milk and cream of coconut. Cook and stir over medium heat until thickened and bubbly. Cook and stir for 2 minutes more. Gradually stir about 1 cup of the hot milk mixture into the beaten egg yolks, stirring constantly. Return all of the mixture to saucepan. Cook and stir until bubbly. Cook and stir for 2 minutes more. Remove from heat. Stir in margarine or butter until melted. Stir in the 1 cup coconut and 2 teaspoons vanilla. Pour hot filling into baked pastry shell. For meringue, in a mixing bowl beat egg whites, 1/2 teaspoon vanilla, and cream of tartar on medium speed of an electric mixer until soft peaks form (tips curl). Gradually add 1/3 cup sugar, 1 tablespoon at a time, beating until stiff peaks form. Evenly spread meringue over hot filling; seal to pastry edge. Sprinkle with the 2 tablespoons coconut. Bake in a 350 degree oven for 15 minutes (keep an eye on it, you don't want to burn your meringue). Cool for 1 hour on a wire rack. Cover and chill 3 to 6 hours before serving (I know, it's very hard but this step is important). I won't put the nutritional facts on this recipe. I just won't do it! Enjoy! I have several pie crusts that I use. 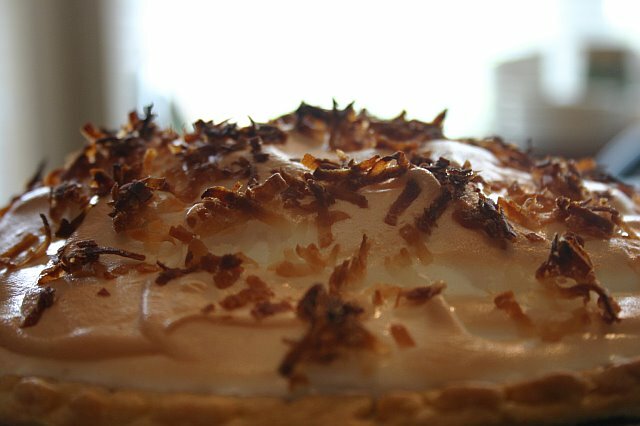 I'm going to share with you one that I find to be very flaky and yummy! I don't know Ruth nor do I know her Grandma but she make's a good pie crust! In a large food processor combine all-purpose flour, shortening, sugar, and salt. Pulse together until crumbly. In a small bowl, mix egg with water. Pulse into flour mixture. Wrap in plastic wrap and chill in refrigerator until ready to use. I'm drooling. I must make this. Looks seriously yummy!